Friends. I stand on the precipice of addiction. Like a crack addict who has beaten the habit and stumbled upon an errant crack pipe, I stare at the precipice of the pipe’s lip. I lean forward. My mouth hovers over the beloved cauldron that held my crack and scorched its contents into my lungs — and I lick the bowl. I have logged back into World of Warcraft. Have you ever heard hoof-beats echo in the amaranthine paradise of Zangarmarsh? Have you ever jonesed for Botanica? You’re never really free of WoW’s talons. Your mind never recovers once your nostrils inhale deep of WoW’s pure item-hungry powder. Look at her. Look at my female warrior. 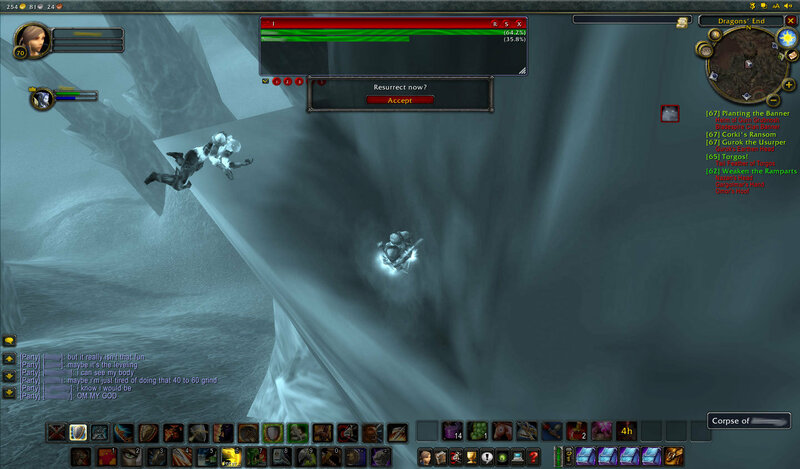 When you die in WoW, you become a spirit of your character and have to run back to your slain body to resurrect yourself. In this screenshot I have fallen off a cliff and died on a spike that protruded halfway down the gargantuan mountain. In order to resurrect I had to leap off the cliff’s edge and attempt to land several seconds down on that exact same spike. In many ways, my current situation is not unlike this screenshot. And this is why I’m glad it costs money to play. I don’t feel the longing call to play WoW because I never did. It always looked interesting, and I knew I probably would’ve enjoyed it, but… it’s more money and time that I don’t have. Heck, I’m lucky I get time/money to play Halo! However, if I put your post in terms of my Halo playing… there have been times where I’d played so long that even after I turned it off, I could hear the sound of assault rifles and warthogs rushing past my earballs. … and now I want to be playing that. i’m back in the game, i always go back now and then. for $15/mo, it’s the cheapest form of entertainment available. a movie is $10, and at most is 3 hours of entertainment. but that doesn’t explain the greatness that is wow. that said, i’ve never had the addiction problem. like many of my other questionable habits, i start and stop as i please, never a slave. i love the game, and i’m back for now, and i love everything about it. i’m glad you’re back, it’s nice to have someone else to talk to.